Used for first aid, is a unique design. 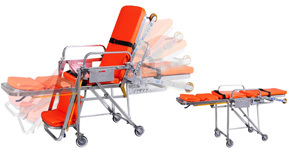 It can easily adjust to various positions for emergency treatment under any complicated situations, especially compatible with ambulance environment. 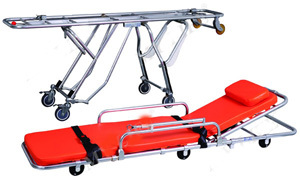 automatic loading stretcher can be operated by one person from an emergency vehicle. It’s a necessity for emergency rooms of hospitals and medical centers. Rolling-wheels design makes model MLF999-C automatic loading stretcher easier to load and unload from an emergency vehicle without lifting it. 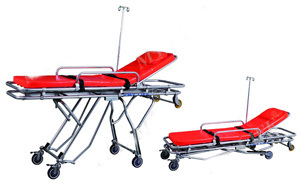 The stretcher legs can fold under cot automatically when loading into the vehicle. When unloading from the vehicle, the legs can unfold and lock into an operating cot position. The safety left and right-hand control levers also unlock front and back legs respectively when unloading from the vehicle, and the polyethylene-covered strips and shock proof legs at the same time prevent sliding and allowing the stretcher rolling smoothly in and out of the vehicle. 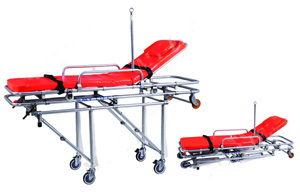 automatic wheelchair type stretcher is mainly for outdoor transportation use. 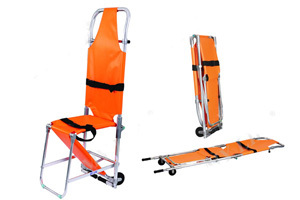 It’s a must-have accessory for ambulances and can be folded into a wheelchair for use in narrow stairs or elevators. The C2 model is made of high quality aluminum alloy. It’s light- weight, appealing, reasonably constructed, easy to operate and antiseptically designed. With soft foam surface mattress and protecting block side, it’s also rust proof and easy to clean. 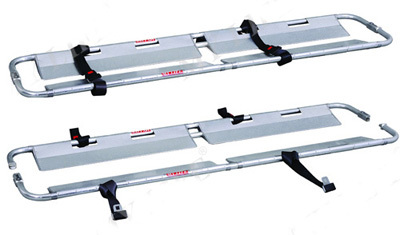 aluminum alloy stretchers for ambulances are mainly used by outdoor rescue teams. 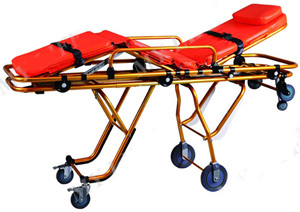 This stretcher is specially designed for the ambulance. Due to its aluminum alloy material tubes and quality design, the B is light weight, antiseptic, rust proof and easy to clean and has an appealing appearance. Made of Foam cushion, the mattress has two easy handling bed binds on both sides of the bed frame to ensure safety. 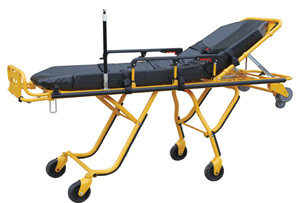 The stretcher can fold back and forth up to 60 degrees angle. Under the bed, there are four removable and adjustable spanners. 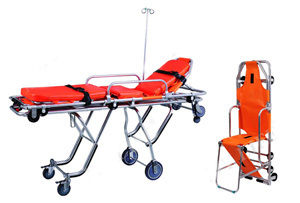 It’s equipped with all-angled rolling wheels, two safety belts and standard lock-in accessories for ambulance use. 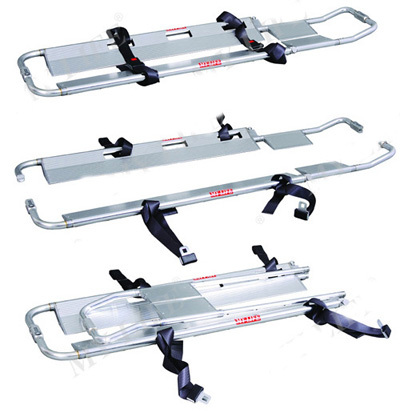 B1 aluminum alloy stretcher for ambulance is mainly used by the outdoor rescue team. 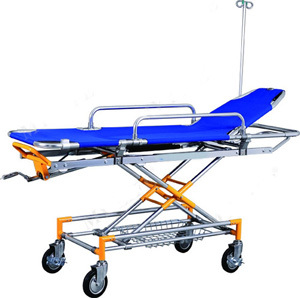 This stretcher is specially designed for the ambulance. Due to its aluminum alloy material tubes and quality design, the MLF999-B1 is light weight, antiseptic, rust proof and easy to clean. 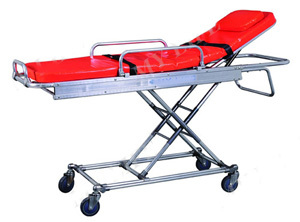 Besides its appealing appearance, the stretcher can fold back and forth up to 60 degrees angle. emergency bed provides handy help for paramedics in medical centers, emergency rooms, first aid units and gymnasiums, etc. Deliberately designed by our R&D staff, the 87-A/B shows its outstanding ability in transporting the patient from the operating room to the ward. Due to its aluminum alloy material tubes and quality design, the 87-A/B is appealing, light weight, antiseptic, rust proof and easy to sterilize. 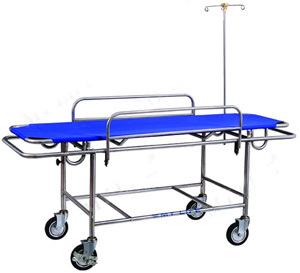 87-C surgical stainless steel trolley, made of high quality stainless steel, is antiseptic, rust proof and easy to clean and sterilize. With its appealing appearance and reasonable design, it’s commonly used in surgery rooms and transferring patients. 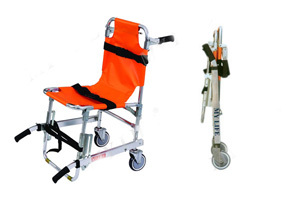 aluminum alloy wheelchair folding stretcher is made of high quality aluminum alloy. With characteristics like light weight, appealing appearance, convenience, antisepsis, easy to clean, it’s mainly used in areas with difficult traffic or entry such as narrow halls, gateways, cloisters or stairs of several turnings. Two 4” rear stationary wheels and two 2” low profile front guiding wheels accommodate transferring on most floor types. Safety locking latch maintains chair’s position during using. 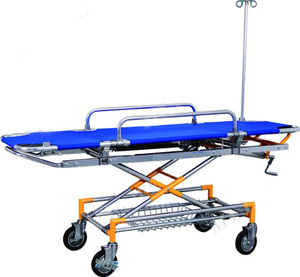 wheelchair type stretcher, made of high quality aluminum alloy, is mainly used in areas with difficult traffic or entry such as narrow halls, gateways, cloisters or stairs of several turnings. This series of products are made of highly strengthened Al-alloy material. Fashionable structure, light weight, convenient, and reliable are some of their advantages. It comes handy under all kinds of circumstances, especially suitable for emergency rooms in hospitals and ambulances. 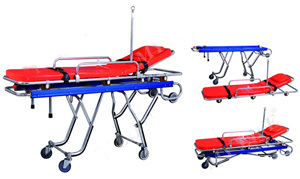 This folding stretcher is made of high strength AL-alloy and Oxford material. It’s portable, light weight, safe to use and occupies small space. Commonly used in hospitals, gyms, ambulances and the army to carry the sick and wounded. 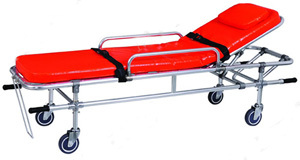 A portable first aid stretcher, is commonly used for transporting bone fractured and seriously injured patients. A clutch zip design at the middle of the model, the stretcher can be divided into left and right parts. Both parts can be drawn out when you need to put the patient on the operating table or the hospital bed quickly without moving the patient. 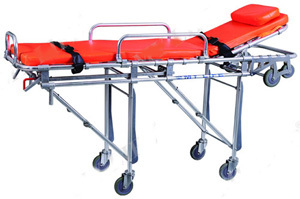 The stretcher length can be adjusted according to the patient’s height. With the patient on, the stretcher can be directly transferred into the ambulance. 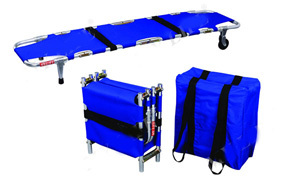 The stretcher can fold or be separated into two parts, easy to carry or transport. 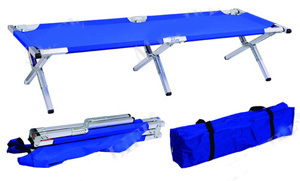 Product Code: E1 spine board is commonly used for safely transporting seriously injured and immobile patients. It can go directly into X-ray room and float on water. It’s a must have in first-aid equipment for medical centers. Made of high strength engineering plastics, this spine board is enduring, anti-aging, weight loading and easy for storage. This product is made of high quality Oxford Fabric, mainly used for corridors, elevators and other narrow and crowded spaces. 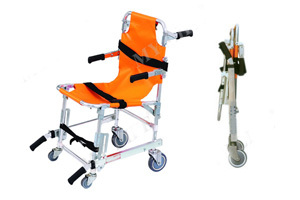 This product is made of high density and waterproof clothing ,foldable and compact,it is used in high area operation and confined space as well as helicopter and wild area operation, wrapped designed prevents the patient feel comfortable and safe from hurting limbs and other parts. Due to its aluminum alloy material tubes and quality design, the 9801 is appealing in appearance, light weight, antiseptic, rust proof and easy to clean. The bed cloth is made of water-resistant Oxford Fabric. It’s foldable and portable. The 9801 camping bed is best for camping, emergency beds, military cot and outdoor getaways.